I’ve been feeling unwell since Monday and lost much of my appetite. My severe headache is killing me, my throat is scratchy, I have blocked nose and can’t breathe. Arrrghhh! Luckily this bowl of steaming hot beehoon/vermicelli soup came to my rescue. Unlike my mother’s common belief that porridge/congee has magic healing power when one is sick, I opted for this dish instead. Ill or healthy, I’ve got to have my shrimp fix. A couple of head-on shrimps, a few dried shitake mushrooms, some fish balls plus the ultimate chili soy sauce, I think I am already feeling better. Heat up the wok with some cooking oil and stir-fry the chopped garlic until fragrant. Add in the can of chicken broth and water and bring the soup to boil. 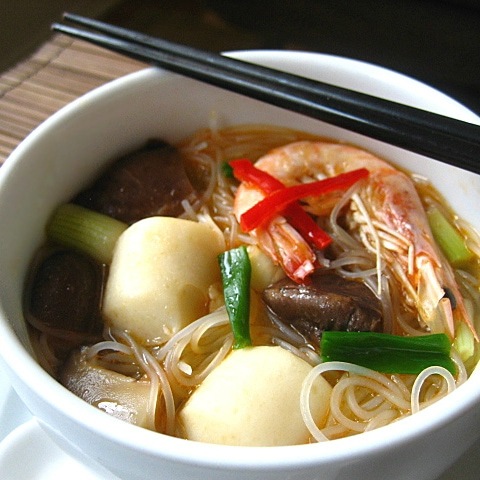 Add in the shrimps, fish balls, and vermicelli. As soon as the shrimps and vermicelli are cooked, add in the seasoning, dish up and serve hot. take care RM, get well soon! OH dear, you better take care ok! I’m sure with that boost of chilli, it will clear up your blocked nose. How come all of you under the weather at the same time, buddingcook, wandering chopsticks, now you? Get well soon, and gear up for CNY! Take good care and drink more water. Oohh..and rest more too. Congee is the true healing food! Congee is king! But your noodles look tasty too. Get well soon. Alamak, not feeling well also cook ah??? Some more such a lovely bowl of noodles you have there! ;O)Get well soon! aiya, i am also suffering the same symptoms. nose blocked, itchy throat, and massive headache caused by the clogged sinuses. when i blow my nose, or go poo poo, my head feels like exploding. summore going off to kuching tomorrow for friends wedding, and head feels like a ton. you passed me the virus via blog izzit??? dis one they call pre Xcitement syndrome….watch out ! i suppose anything that is steamy hot and soupy is good for healing! (esp. the blocked nose). hope you are feeling much better now, BY. It seems like everyone is getting sick! Hope I don’t catch it, but if I do, I think this recipe will nurse me back to health. The chili especially. BTW, it’s a testament to how good a cook you are that you make such elaborate dishes, even when you’re sick. Reminds me of that scene from the movie Tampopo, when the dying woman uses her last breath to cook her family a final meal. Like Malaysian Penicillin- Malaysiacillin? Feel better. girl, sorry to hear tht ur sick again. 2nd time this season ya? I’m going to have you come over next time I get sick. Get well soon! Hey feel better RM! It’s that time of year!!! Cold outside and warm inside … when you’re in and out of those kind of temp. sure to get sick!!! Your soup looks delicious! When I am under the weather! I always love spicy stuff! The steam from the hot broth will definitely clear your blocked nose! Do get better soon. CNY is just around the corner. Lots of goodies to eat! You get some rest gurl. Have to attned a party next week remember? Get well soon! I’m also troubled with sore throat, blocked nose and coughing for the past week! Hope you will feel better soon. This dish looks absolutely delicious! Yes, get lots of rest, and make sure that other people cook for you! Hope you feel better soon Bee. Get well! Get well! U’ve got a plane to catch. As I am still weak so I am not going to respond to you one-by-one, but thanks so much for your kind words…yes, I will get well soon as I want to serve up more great dishes for you all. Hope you are feeling much better. I am with you…noodle soup especially beehoon noodle soup rules my world. I always say, if I can only eat one meal for the rest of my life, it would be noodle soup. Although, I must say congee is amazing for a very dreadful hangover. Even my very gwai-lo husband has succumbed to the healing powers of congee. This beehoon soup sure is good when one is feeling under the weather. 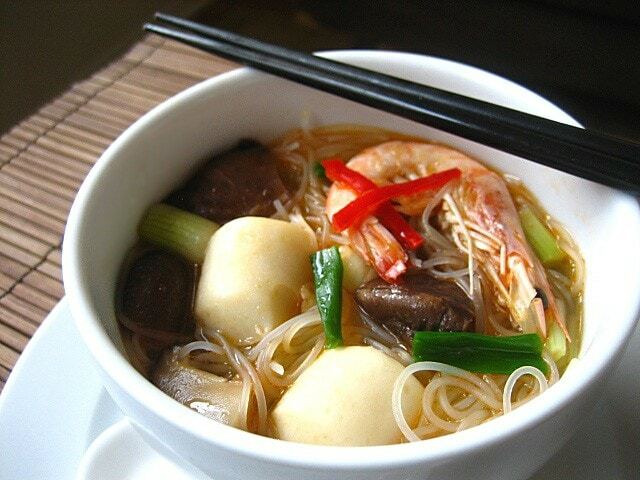 I like the sound of your beehoon soup recipe and will give it a try soon.